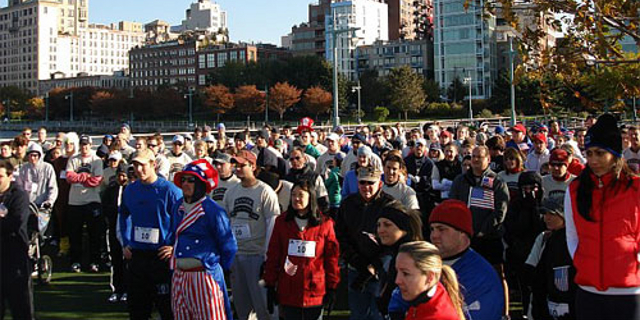 A few weeks before Veteran’s Day several of Jimmy’s Duke lacrosse teammates decided to remember Jimmy by having a run alongside the Westside Highway in Manhattan. The idea quickly evolved into the “Run Down Hero’s Highway” and on November 11th, over 400 people gathered to run 4 miles in memory of Jimmy and in support of the Lead the Way Fund. Jamie Brodsky, Keating Crown, Drew Stroud, Dan Hauber, and Daniel Roediger truly organized a wonderful event. As everyone arrived, they were given t-shirts and race numbers, #10, Jimmy’s number when he played at Duke. Everyone had been invited to participate in the most patriotic costume contest for the run and so we were joined by Uncle Sam, an American Eagle, and two Captain America’s, as well as several other red, white, and blue costumes. Before the run, Jim Regan addressed the crowd reminding everyone of the example Jimmy had set serving our country as well as the needs of the Rangers who continue to serve. Special thanks to Joey Horowitz as he played a very moving rendition of God Bless America and the race began. A few trailblazer’s led the way and everyone followed along the race route. The route traveled down the Hudson River Park, past Ground Zero with a glimpse of the Statue of Liberty. This hallowed ground of lower Manhattan on West St., affectionately deemed “Hero Highway” as many people used this rout to escape the 9/11 attack on our country. The youngest participant of the race was Jimmy’s four week old cousin, Molly Regan, traveling by stroller. Dan Hauber, one of the race organizers, must have run at least 8 miles as he continually doubled back to join different groups of runners in order to make sure everyone was having a fun time. Even more impressive, the previous weekend he completed the NYC marathon (also in memory of Jimmy.) After the race the crowd gathered for a group picture and then moved quickly out of the cold into the warmth of the Brass Monkey for breakfast and song with entertainment provided by Joey Horowitz. What a special day!